Converter lead to connect your OptiMate with SAE-compatible connector (before 2012) to TM-accessories. This Converter lead will connect your OptiMate with its SAE-compatible connector to TM-accessories (as used with AccuMate and 2012 and older OptiMate models). 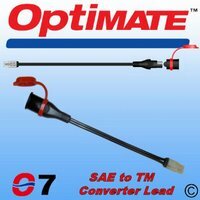 Simply plug one end of the converter lead into a standard OptiMate TM lead (such as TM71) and you can then use a newer OptiMate, or other SAE accessory. In this way, you can connect an SAE compatible OptiMate to a bike or car equipped with a TM lead. Supplied complete with removable weatherproof rubber cap. To convert an AccuMate, AccuMate PRO or OptiMate fitted with the white TM connector to use the SAE compatible connector, order the TM77.